Every Canadian should have the opportunity to travel to Europe and walk in the footsteps of those who served in the First and Second World Wars. There, part of our history is somehow more tangible; it is found in the cemeteries and on the faces of the people who tend them and remember. For one lucky artist, that opportunity came her way as part of National Defence’s Canadian Forces Artists Program (CFAP). Karole Marois was chosen to paint the 60th anniversary of the liberation of the Netherlands for CFAP. The impact of that trip was so deep that five years later she is doing it again—creating an even bigger and bolder series to commemorate the 65th anniversary of the liberation. The headstone-like panels of Together Side By Side commemorate the service and sacrifice behind the liberation of Europe 65 years ago. Marois was born in Ottawa in 1958, and almost 20 years later graduated from Toronto’s Ontario College of Art and Design. She continued her studies for two years at the Academia di Belle Arti, Florence, Italy, and has worked as a figurative painter and exhibited in private and public collections across the country. In 2005, Marois spent three weeks in barracks with 250 serving members of the Canadian Forces in Harskamp, Gelderland. As a result of that trip, the artist created 13 acrylic canvas panels, each 122.1 cm high by 30.3 cm wide (approximately four feet by one foot) titled The Parade. These panels capture many contrasts: grey rain and multi-coloured flags, lively crowds alongside gravestones, today’s soldier and yesterday’s veterans, and liberation contrasted with war. Marois later said, “I purposely chose this shape of canvas so that, when installed side by side, the complete artwork would look like a row of soldiers or a row of gravestones.” This collection will be part of the Canadian War Museum’s travelling exhibition titled A Brush with War: Military Art from Korea to Afghanistan, which will be exhibited across the country until 2012. 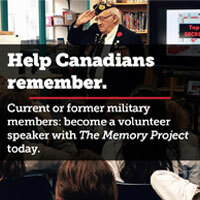 Marois has found 65 different ways to say thank you to our veterans in 2010.